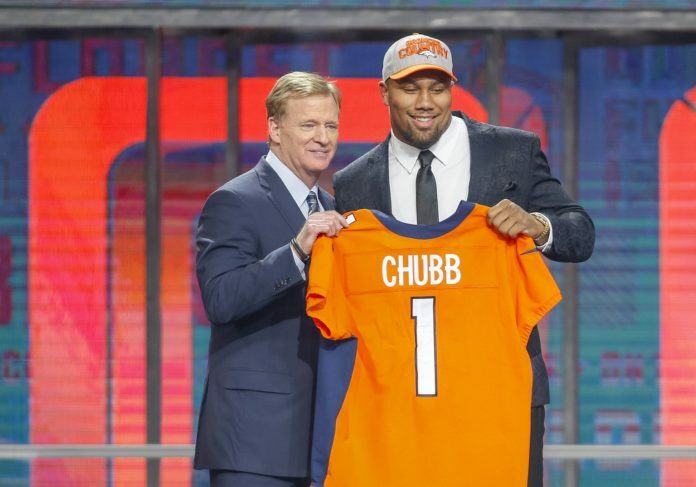 When Bradley Chubb landed in the Broncos’ lap with the 5th overall pick, did the team find the next elite defensive star? 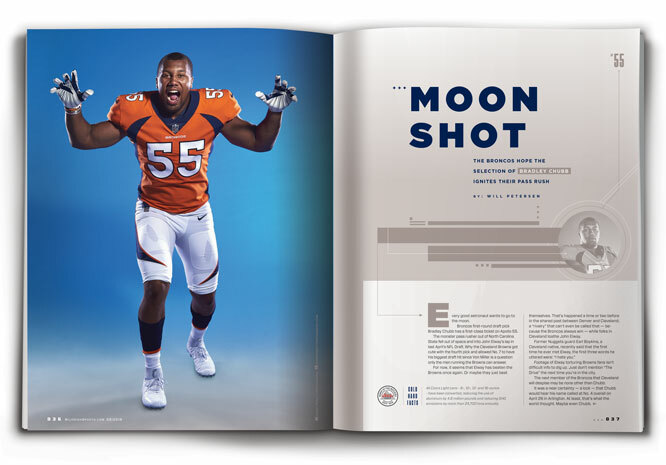 *A version of this story appears in the August issue of Mile High Sports Magazine. Subscribe here! Every good astronaut wants to go to the moon. Broncos first-round draft pick Bradley Chubb has a first-class ticket on Apollo 55. The monster pass rusher out of North Carolina State fell out of space and into John Elway’s lap in last April’s NFL Draft. Why the Cleveland Browns got cute with the fourth pick and allowed No. 7 to have his biggest draft hit since Von Miller is a question only the men running the Browns can answer. For now, it seems that Elway has beaten the Browns once again. Or maybe they just beat themselves. That’s happened a time or two before in the shared past between Denver and Cleveland. A “rivalry” that can’t even be called that — because the Broncos always win — while folks in Cleveland loathe John Elway. Footage of Elway torturing Browns fans isn’t difficult info to dig up. Just don’t mention “The Drive” the next time you’re in the city. The next member of the Broncos that Cleveland will despise may be none other than Chubb. It was a near certainty — a lock — that Chubb would hear his name called at No. 4 overall on April 26 in Arlington. At least, that’s what the world thought. Maybe even Chubb. Talented Oklahoma quarterback Baker Mayfield went No. 1 overall to the Browns. Stud running back Saquon Barkley went from Penn State to the Giants at No. 2 and the Jets got their franchise quarterback in USC’s Sam Darnold at No. 3 overall. Pick No. 4 — Ohio State cornerback Denzel Ward — surprised everyone but the well-informed Chubb. “At the end of the day, I’m here, so I’m happy to be here. Like my agent told me, ‘Don’t be surprised,’ so no surprises,” Chubb said on April 27 in the Broncos’ state-of-the-art practice facility, moments after his first-ever press conference in Denver wrapped up. Only one night before, the football world was perplexed when NFL commissioner Roger Goodell announced that the Browns were taking cornerback Denzel Ward out of Ohio State at No. 4 overall. Apparently, Chubb’s agent, Erik Burkhardt, prepared his client for that stunner, but it was shocking nonetheless. Fewer than 24 hours later, Burkhardt let Chubb and his entire family mingle with the Denver media before they flew home to Atlanta. It had been an exhausting and unexpected 24 hours, but the atmosphere inside Pat Bowlen Fieldhouse felt more like a cocktail party than a press conference. Just no booze. Brandon, 24, played at Wake Forest from 2012-2015 and had stints with the Rams, 49ers and Lions before ultimately being waived by Detroit on May 30. Bradley, 22, is the better football player. That’s not a secret when one guy went undrafted and the other was in the conversation to be the first overall pick. Don’t worry: There’s no family drama. Brandon and Bradley’s parents, Stacey and Aaron, are equally popular at the post-press conference mixer, as every member of the thirsty crowd of people are trying to steal a few minutes in a casual setting. The difference between “on the record” and “off the record” in this business is real, and Burkhardt and the Broncos’ PR team are in no rush to tell anyone to go home. “We’re a very tight-knit family,” Stacey said. “I’m proud of both Bradley and Brandon,” Aaron added. Translation: We’re here to celebrate Bradley, but just because he’s a future NFL star doesn’t mean we don’t love both boys equally. The Broncos have had a handful of character concerns over the last few years – a couple very public and embarrassing incidents with star defensive players (see Ward, T.J. and Talib, Aqib) –but character isn’t a concern with Chubb. Far from it. Money can change people; there’s no sense that will happen here. As he finishes up interviews with every local television station, there’s a sudden sense of urgency created by Burkhardt and Broncos PR. The Chubbs had to go, or they might miss their flight home. Roughly two months later, Chubb was back in the Pat Bowlen Fieldhouse – but this time it’s wasn’t for a party. The business of an NFL player. These guys have it good. 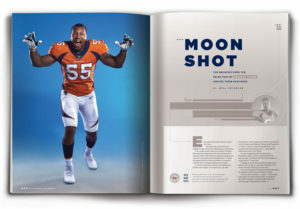 As the Broncos’ offseason activities roll along in mid-June, the team hosted an unofficial media day for television crews from around the country, in-house media and this fine publication to get whatever they needed. Here’s your chance: Do the photo shoot, another interview and then don’t ask again. 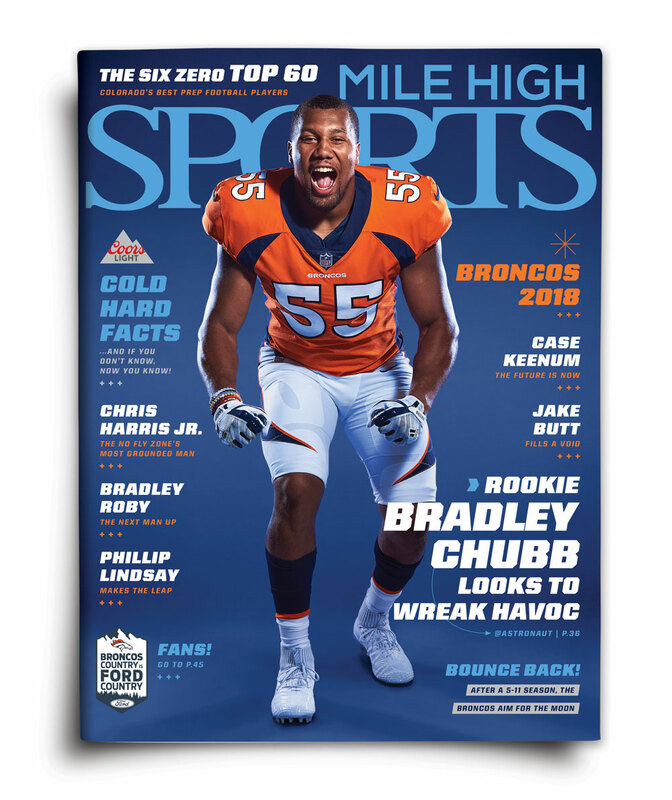 Mile High Sports Magazine has found a nice niche with the Broncos’ defense. For whatever the reason, that defense seems to like us. 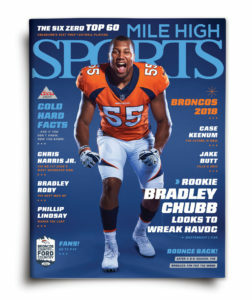 Get a fancy cover and join a club that includes Von Miller, Shane Ray, DeMarcus Ware, Chris Harris Jr., Bradley Roby, Darian Stewart and the aforementioned Talib and Ward. Chubb was up next, and the dude owned the room. The funniest part was his wardrobe. A full gameday football uniform except a No. 55 Broncos jersey with the name “Day” still on the back. That would be little-known former Broncos center Dillon Day, who had good hair. That’s about it. “I legally changed my last name,” Chubb says with a grin before his photo shoot begins. As the first-round pick and humongous human steps onto the set, his cleats immediately begin to destroy the paper that’s been laid out as a backdrop and for him to stand on. “My bad! Is that okay?” A genuinely sorry Chubb says. Yeah, dude. It’s just paper. And you’re 6-foot-4 and 269 pounds. But thanks for being so cool, even after your bank account just ballooned bigger than any of us can imagine. Chubb finishes the shoot at precisely 2:02 p.m., takes a look at some of the best shots on a computer and now has a special-teams meeting at 2:15 he can’t be late for. Walk and talk? Walk and talk. We need to go to the moon. Chubb’s social media “handles” on both Twitter and Instagram are currently @astronaut, arguably the most interesting identity in sports. Everyone wants to stand out from the crowd – Chubb does in more ways than one – but this is a wrinkle that has to be investigated. “I don’t even know, my agency did it for me… One of our marketing folks did it for me. I got drafted, I woke up, and it was @astronaut,” Chubb says with a smile. It’s good to have folks working for you. How did that idea came about? No shocker; it goes back to Bradley’s brother and best friend, Brandon. The Chubb brothers know what they’re doing on the football field and are equally as smart off it. Everything, (maybe everyone?) is a brand in 2018 — and the two decided to embrace that reality. “It came about from the rapper Future, actually. My brother and I have always looked at the future. (Brandon) was the one who came up with it at first and he called me ‘Astronaut Jr.’ and I had names like ‘Astro-Chubb’ and ‘Astro-nine’ and I was thinking, ‘How cool would it be if I just had the single name Astronaut?’ It had to get approved through Twitter apparently and everybody was like, ‘Oh my God, how did you get the name? !’” Chubb says. The astronaut has landed. Denver, we have no problems. At least not with Chubb. There’s a sense the Broncos will have the best pass rushing unit in the NFL. Miller and Chubb figure to be the starters, terrorizing quarterbacks from the first snap. Shaq Barrett will slot in as the No. 3 outside linebacker ahead of former first-round pick Shane Ray at No. 4 — a man who was the subject of a lot of chatter this offseason. “Honestly, I’m not upset,” Shane Ray says adamantly in mid-May at Coors Field. Twentieth and Blake. Coors Field. The official site of ‘Rocktober’ in 2007. UCHealth is a major sponsor on the Colorado sports scene, working with the Avalanche, Broncos, Nuggets and Rockies, so the fine folks at the company decided once again to get premiere local athletes (and some media members) together for batting practice. The Rockies played at home that night, May 11 to be exact, so their stars showed up for support. It was a who’s who of Denver sports all in the same place. Pretty cool, actually. Gabriel Landeskog talking with Charlie Blackmon. Jamal Murray messing around with Brandon McManus. And Shane Ray, eager to talk with anyone who would listen, just a few days after a social media blackout. Ray lost $9.2 million nine days prior when the Broncos declined to pick up the fifth-year option on his rookie deal. It was the first time anyone had access to chat with him and he wanted to make one thing clear: There were no hard feelings on the selection of Bradley Chubb, despite what he may have portrayed on Twitter. “This is motivation for me, man. I’ve got this season in Denver and will mentor (Chubb) then we’ll see what happens,” Ray says. Very few expect Ray to be back with the Broncos in 2019 after Elway declined to pick up the option, but Ray knows it’s a business. He’s also targeting a Week 1 return vs. the Seahawks, but after yet another wrist surgery this summer, plenty of skeptics say that’s not realistic. Ray — who’s a refreshingly blunt interview — says it’s “not a long shot” he’ll be out there in the season opener. The problem for him might be, ready or not, that it could be tough to see the field. “Having three or four rushers is a good thing. (Chubb) is going to come in and compete for the starting job, obviously. You have to have more than two rushers. Having four is always a good thing,” head coach Vance Joseph said on draft night. “You can never have enough pass rushers,” John Elway added. The Browns’ blunder cost Ray a winning lottery ticket in terms of cash. His fifth-year option (and all that money) is probably picked up if Chubb is not on the board at No. 5 overall. But it also opened up a star-studded room in which Chubb can learn; a process that began in May and June and will only get more intense come August, September and beyond. Nearly two months after Cleveland shocked the football world and created another groan heard throughout Ohio, Chubb still sometimes wonders what they were thinking, but he’s not losing sleep over it. Quick: Name the Browns’ best pass rusher. Bet you couldn’t do it. In Denver, it’s Miller, Barrett, Ray and now Chubb. He’s landed in a much better situation. “I mean, like I told you a while back, I wasn’t really disappointed or anything. I wasn’t surprised or anything. It was just one of those ‘I guess I’m going somewhere else instead of Cleveland’ things. That’s all,” Chubb says, after finding time to digest that he’s looking for a place to live in one of America’s prettiest cities. And it’s not just the former Super Bowl MVP Miller that Chubb will learn from. The news broke on June 13 that Denver hired former pass rushing star DeMarcus Ware as a “part-time consultant.” Ware will work “a few days a week” with the likes of Miller, Chubb, Barrett and Ray. Essentially, Ware’s duty is to keep Miller a star, make Chubb a star and keep Barrett and Ray as serviceable rotation guys. Miller, arguably the most famous person currently living in Colorado, was thrilled to have Ware back not only for himself, but Chubb as well. “I mean, he’s got a Hall of Famer. He’s got a guy that has done everything right. You’ve got a technician. You’ve got ‘Captain Football’ in DeMarcus and then you’ve got me — (I’m) going to keep it all the way real about everything, tell you how I feel and (I’m) going to be honest,” Miller said of the Ware hire, and its potential impact on Chubb. Chubb isn’t overwhelmed by the support the Broncos have gone out of their way to give him. He is a top-five pick, after all, but having Miller and Ware as mentors is a QB-killer’s dream. For now, the 22-year old is focused on getting to know his new state — and making sure he doesn’t miss that 2:15 special teams meeting. “I’d been out here one time — I knew there was a lot of mountains and stuff,” Chubb says, as he asks a member of the Broncos’ staff for assistance taking off his No. 55 Dillon Day jersey. Chubb will wear 55 for Denver this season; he jokes that they should have his name on the back of the uniform by some point. And with that, the clock says 2:13, and a shirtless Bradley Chubb is standing in the Pat Bowlen Fieldhouse nearly all alone. No mom. No dad. No brother. No agent. No cocktail party. Just a meeting he can’t be late for. “Take care,” Chubb says, as he disappears down a dark hallway, headed to a meeting for a group he probably won’t play a snap for. Hopefully, he found a shirt. It’s a long way to the moon, but every astronaut dreams of getting there. For Bradley Chubb, NFL stardom could launch him anywhere.